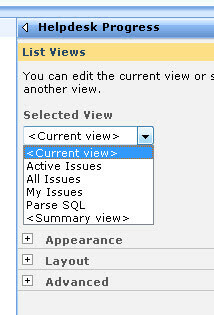 When a SharePoint list or library is added into a web part zone, whatever view I choose does not change when I update the view from the list or library settings. That's right! When you add a SharePoint list or library to a web part zone on a site page or web part page, whatever 'view' you choose stays frozen with all the view filters and other options. ...you can see that any views currently in the list, are available to show. But once chosen, those filters, groupings and other options that were set when the view is applied to the web part zone, do not change if you change the underlying view in the list or library. 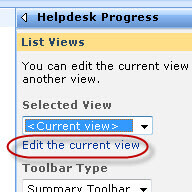 The only way to update the view on the site page (or web part page) is to reselect the "Selected View" from the "Modify Shared Web Part" settings or to use the "Edit the current view" option. Good part about all this is if someone sets up a site page or web part page with a specific purpose and the underlying view gets changed at some point in the future, the original purpose of the page stays intact. The bad part is that if you change a list or library view thinking you are going to roll out those changes globally to any web part pages (or the site page), that would be a wrong assumption. Personally, I have learned to deal with this behavior. The main point is to have an awareness about the issue.